Dubai: Emirates’ historic five-year revenue sharing partnership with Qantas launched under much fanfare a year ago on Tuesday. But in February the partnership came into question when Qantas’ international division’s earnings before interest and tax (EBIT) losses increased from $91 million Australian dollars to A$262m in its half year results. Analysts continue to state that Qantas needs Emirates. But it is unclear how much the partnership has delivered to Qantas International’s bottom line, according to Daniel Tsang, Founder and Chief Analyst at Hong Kong-based aviation consultancy, Aspire Aviation. The partnership provides Emirates with access to domestic Australian destinations that were previously out of reach. “Now Emirates has 55 destinations in Australia without incurring the cost of operating flights,” Tsang stated. Qantas, on the other hand, now has flights to more than 65 destinations in the Middle East, North Africa, the UK and Europe with the partnership. On Tuesday, a Qantas spokesperson stated that under the new partnership bookings have surpassed expectations and are more successful than under its previous partnership, which was with British Airways. To date more than a million passengers have flown on Qantas flights through Dubai since it moved its London-bound stopover from Singapore to Dubai. “It has made a huge difference to challenges we had in Europe and provides a compelling one stop offering to our customers,” the Qantas spokesperson stated. John Strickland, Director of UK-based aviation advisory JLS Consulting, stated that Qantas’ problems only make it more valuable to have established the partnership with Emirates. “This will increase their (Qantas’) ability to rationalise and optimise the shape of the future network by focusing their own resources on Asia,” he said. In 2013, Australasia was the second fast expanding market for passenger traffic travelling through Dubai International, growing by 33.4 per cent, according to Dubai Airports. 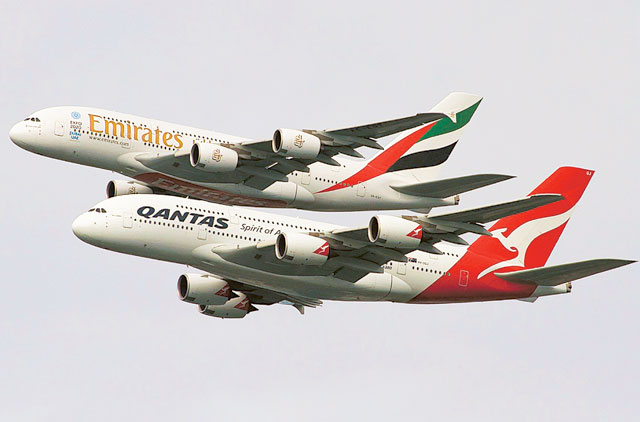 Qantas and Emirates offer 98 flights per week between Australian and Dubai.